The Blue Ribbon Study Panel on Biodefense today unveiled A National Blueprint for Biodefense: Leadership and Major Reform Needed to Optimize Efforts, a bipartisan report outlining national vulnerabilities to growing biological threats and providing recommendations on improving the U.S. biodefense posture. Hudson Institute hosted the Blue Ribbon Study Panel series, convening executive stakeholders throughout government, academia, and the private sector, for targeted and extensive discussion on the state of U.S. biodefense. The panels featured former administration and congressional officials, including Joseph Lieberman, Thomas Ridge, Donna Shalala, Thomas Daschle, James Greenwood and Kenneth Wainstein. The report emphasized a lack of centralized leadership for biological threat preparedness. 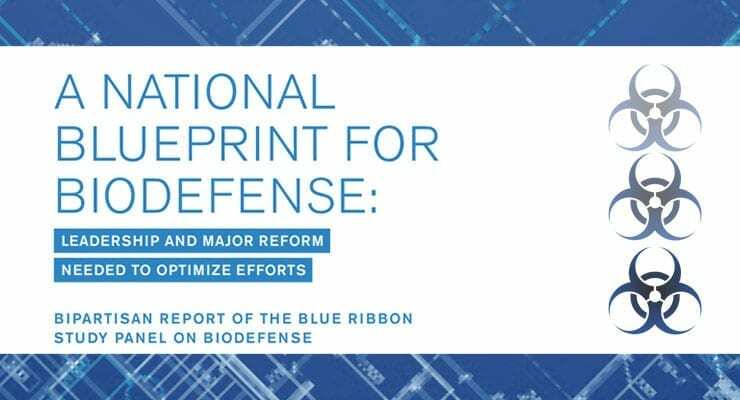 Read the full report: A National Blueprint for Biodefense: Leadership and Major Reform Needed to Optimize Efforts.